Gerber contributed extensively to the Marvel Comics stable in the 1970s, working on such mainstream titles as Iron Man, Daredevil, and The Fantastic Four as well as more offbeat series where his creativity was probably seen to better effect, including Shanna the She-Devil and Man-Thing, the latter of which featured the first appearance of Gerber's cigar-chomping duck. His career was marked by disputes over creator's rights, including legal action against Marvel over the ownership of Howard, and criticism of the revival by author Jonathan Lethem of the character Omega the Unknown, which Gerber had co-created. 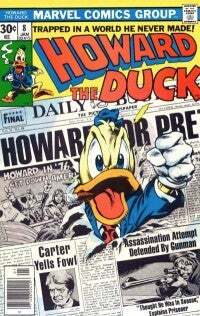 He also suffered the indignity of George Lucas' box-office-bomb Howard The Duck movie, into which Gerber had little to no creative input. His friend and colleague Mark Evanier, who broke the news on Gerber's website, also posted an extensive biography and reminiscence of Gerber. Tom Spurgeon also posted a worthwhile obit at the Comics Reporter website.